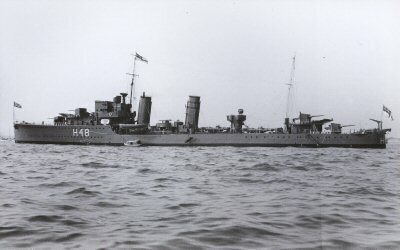 Lost: 25 Jun, 1940 (c 45-45'N, 1-30'W) Western Europe, off Gironde Estuary, western France - by collision with RN cruiser 'Calcutta'. History: At 10.30 PM on the 25th of June 1940 HMCS Fraser was given orders to proceed to Bordeaux, France to help in the rescue of an estimated four thousand refugees trapped in the area by the German military forces. Accompanying the Fraser was the Canadian destroyer HMCS Restigouche and the British cruiser HMS Calcutta . In rough seas and poor visibility, the captain of the Fraser decided that the three ships should move closer together and ordered a turn to port in order to bring his ship behind HMS Calcutta. In doing so the two ships collided, the bow of the heavier Calcutta sliced into the side of the Fraser with such force that the lighter vessel was cut into three pieces. Forty-five crewmembers were killed and nineteen men from the Calcutta lost their lives. Many survivors from the Fraser were later lost on October 22, 1940, after being transferred to the destroyer HMCS Margaree which sank after a collision with the freighter Port Fairy.